Is washing my car at a commercial car wash really better for the environment? Definitely! In commercial car washes, chemicals are filtered and sent to a water treatment center for cleaning. Conversely, a driveway car wash sends untreated waste water (including soap, oil and sludge) directly into the environment via storm sewers that lead into our rivers, lakes and streams. And a driveway wash uses up to three times more water than washing at a commercial car wash! Can car wash products that are safer on the environment still clean a vehicle really well? Absolutely! Car wash products don't have to be harmful to the environment to effectively clean vehicles. In fact, Blue Coral® Beyond Green products used in many car washes deliver powerfully clean, well-protected, shiny vehicles. And equally important, they're easy on the environment. Products, processes and developments that are sustainable mean they meet the needs of the present without compromising the ability of future generations to meet their own needs. From the factory to the final rinse, the Blue Coral® Beyond Green products support your local car wash's commitment to respect the environment every step of the way. We take a comprehensive approach and consider the total impact of our products in terms of safety, energy and water usage, and waste to meet the strictest regulatory requirements in North America. Is it possible to wash vehicles using chemical-free solutions? No. All living things are made of chemicals. Even water! Blue Coral® Beyond Green products used in professional car washes are designed to minimize the impact on our environment. My local car wash is part of the Blue Coral Beyond Green program. What does this mean? With the help of Blue Coral®, your car wash made a commitment to use only products that clean and protect your vehicle and reduce or eliminate the release of specific compounds into our air and water. Why don't all car washes participate in the Blue Coral® Beyond Green Program? Becoming part of the program means going the extra mile and taking conscious steps toward minimizing our impact on our environment. It means doing the right thing because it's environmentally correct while delivering exceptionally clean and shiny vehicles. 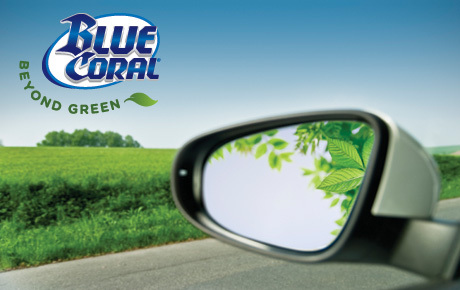 The small change you make by using a Blue Coral Beyond Green car wash has a big and positive impact on our environment.